At first , there was a vest. 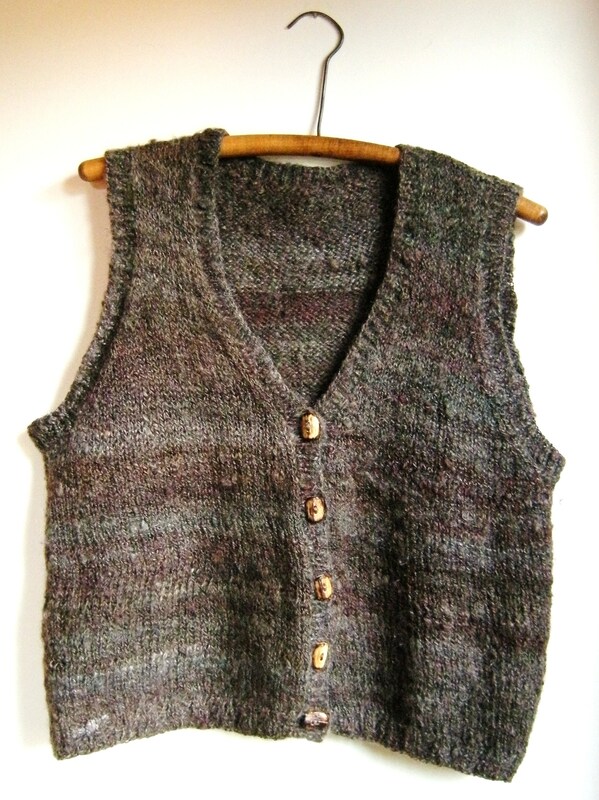 That is to say, the vest was the absolute first thing I spun and knit, during the Autumn of 1987, and it was my first project in my Wednesday morning spinning class. But to start, a little backstory is needed. A non-credit and free community college class , was the bright and lucky beginning of my love of spinning and of textile creations. On the brochure it was listed in its first semesters as just “Hand Spinning” , then later “Textile and Fiber Arts”, but the long-standing class which spanned two decades at the Goat Hill Farm was just one of those legacies which aren’t realized until they are gone. When one stepped into the class for the first time, it might be like falling into a dream, and stepping a hundred years back in time. I feel I was very lucky to be one of the people involved, even if mostly just in the first decade. We gathered in the basement of Joanie’s Victorian house, there on the farm, a room she made incredibly charming for the classes and a delightful hybrid of yarn studio , livingroom, and country kitchen all in one. 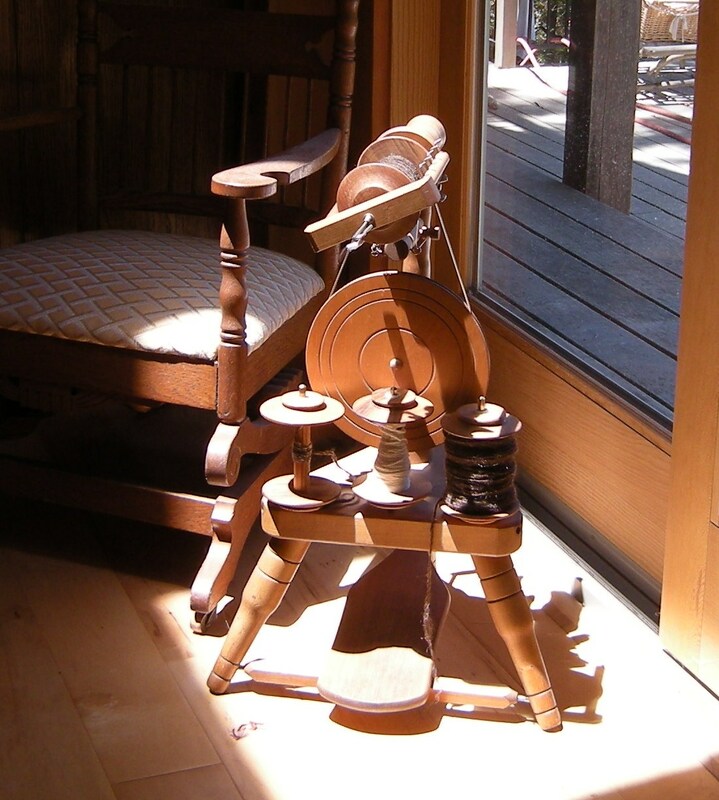 There were many places to sit in a circular fashion, of antique couches, loveseats, and chairs, with trunks and baskets of wool overflowing about the place, an electric drum carder, picker, carders and niddy noddys and impliments of spinning everywhere one looked. 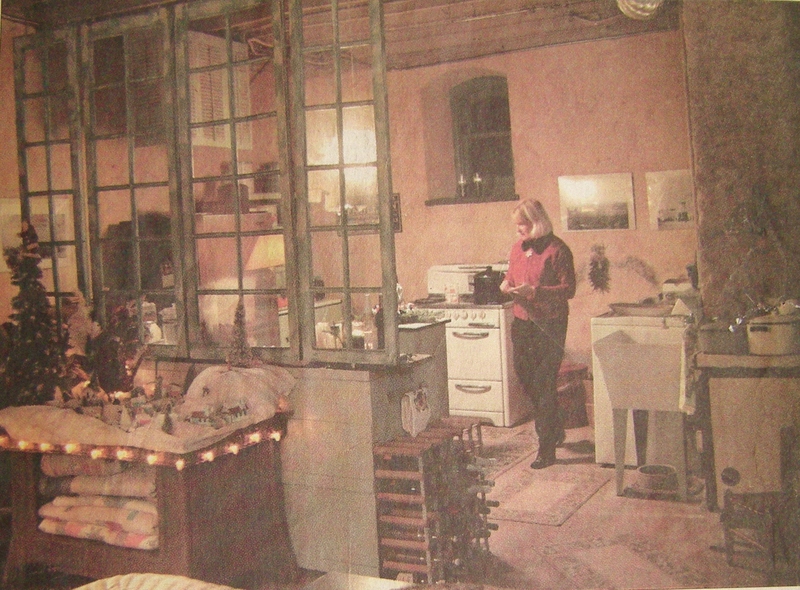 A section of the basement was partitioned into a kitchen with stove and sink whereby we dyed fleece, roving, and yarns , and there was usually a dyepot simmering . And if that wasn’t enough, there was always coffee, tea, and cakes or pies made gratis usually by Joanie, but also we ‘students’ would contribute, so there was always a bounty. 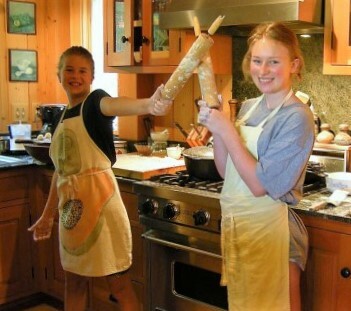 A photo clipped from a feature article I’ve saved, which ran December 2005 in the local newspaper about Joanie’s class during the height of it’s popularity, and just before it came to its end after 20 years. I remember each Wednesday morning the basement room would crescendo into a loud cacophony of laughter, whirring spinning wheels, and gossip, and over those genuinely influencial classes, and fresh cakes, we more or less evolved into a bonded group of friends for a time. This group of spinners I met up with on and off for well over a decade. Ahem …. back to the vest. For this vest I spun some Lincoln-Corriedale wool fleece ‘locks’ I purchased from the stash of fleece for sale at the Goat Hill Farm, my first spinning project on my brand new Peacock Wheel (also purchased through Joanie) and I spun the lock-like fleece uncarded and unpicked ! I had dyed the locks in the group with RIT dyes of greens and burgundies and browns (I still have those notes !). I had worn it throughout several winters in a row, washing it only ever once. A moth got to it, twice, and I’ve had to darn those holes. 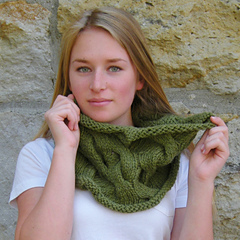 All in all, it is my most treasured knitted thing I have ever knit to date, having my mother’s instruction to shape the flat-knitted sections, sew together, and knit on neck, arm, and button bands. Her instruction is etched into my memory forever with this vest. Another rather remarkable thing associated with this vest , is recalling a bout of tonsilitis I had come down with as I had been bicycle commuting all winter and on antibiotics and off of work (working at a bakery at the time) , and luxuriated in bed for two weeks, long enough for to knit this from beginning to end, with the help of my mom. 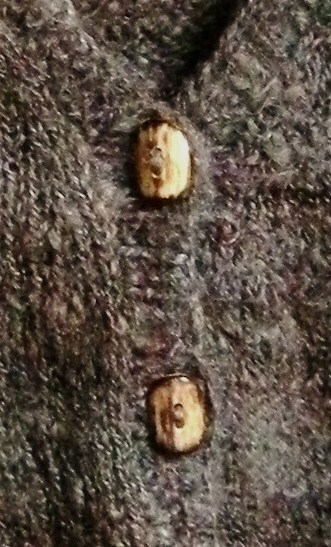 A third and perhaps most special thing about this vest, was that in the excitement and encouragement of my first handspun & handknit project, my friend and duo-mate John made for me a set of deer horn buttons, from an antler I brought to him. … as John cut squares off of the antler on his band saw, shaped them so nicely on his sander, drilled holes in them with his drill press, then torched the edges, then gave them some wax. They absolutely make the vest the most beautiful thing in my cedar chest, like something from a museum ! 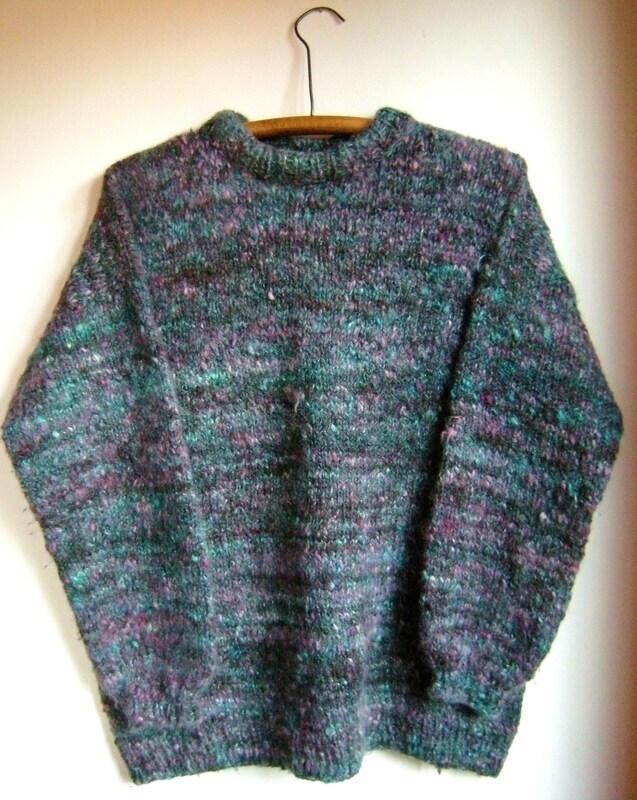 This pullover is very dear to my heart, made in ’91. I carded a blend of fleeces from my own animals ! Among the fleeces used were ; a brown Lincoln- Corriedale fleece from my ewe named Hazel, mohair from my angora goat named “Nash” , dyed greens and turquoise and teals, and angora hair from two of my fawn colored angora rabbits, dyed old rose tones and maroons. 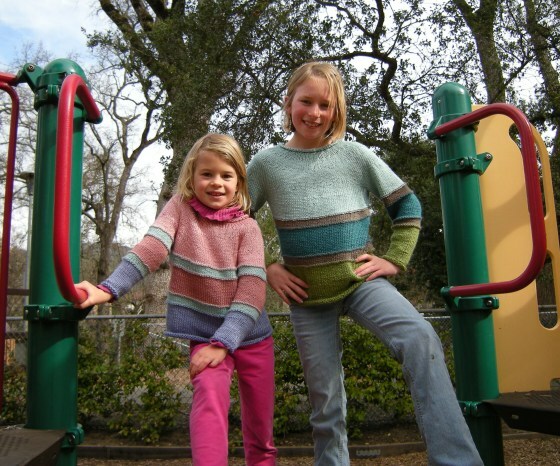 The most memorable thing about this sweater is the fact that I had knit it three times ! I knit it first into a v-neck cardigan, shortishly cropped, which didn’t do, as the yarn was rather bulky and it looked very stiff and wrongly proportioned, and I had a ton of yarn left over. I then ripped that out and reknit into another v-neck cardigan style, longer(or maybe doubled the yarn? )… but didn’t do either, as I just looked and felt horrible in it. Finally ripped out and knit over into a pullover, tried hard to use up all the yarn I had spun, with the neckstyle crew and hemmed over. Not sure I like the neck, so I may still change the neck to a turtleneck, as I have still about a half ball left over and hiding in the cedar chest with it.